In this episode, friendship is magic. 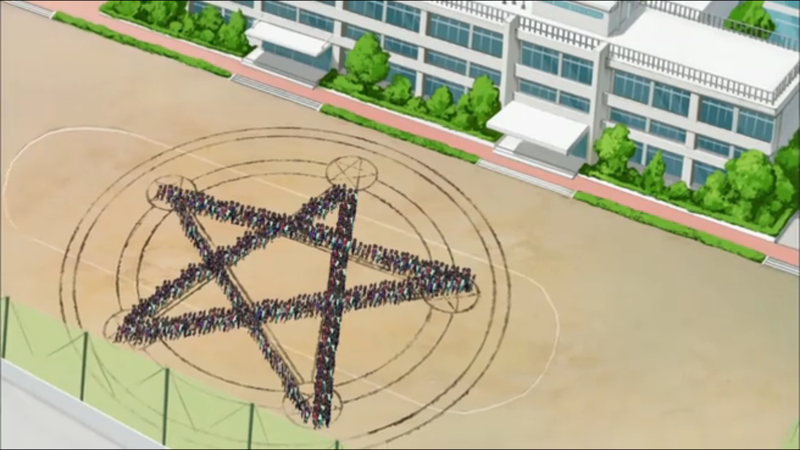 Dark, Satanic magic that possesses the school to form a human pentagram to empower a demon, but magic nonetheless. If Hunters ever was going to get a dub, this might be a candidate for the first Digimon episode to be completely censored out of existence. Phelesmon is pretty damn demonic. You can't go Adventure and make the pitchforks disappear. 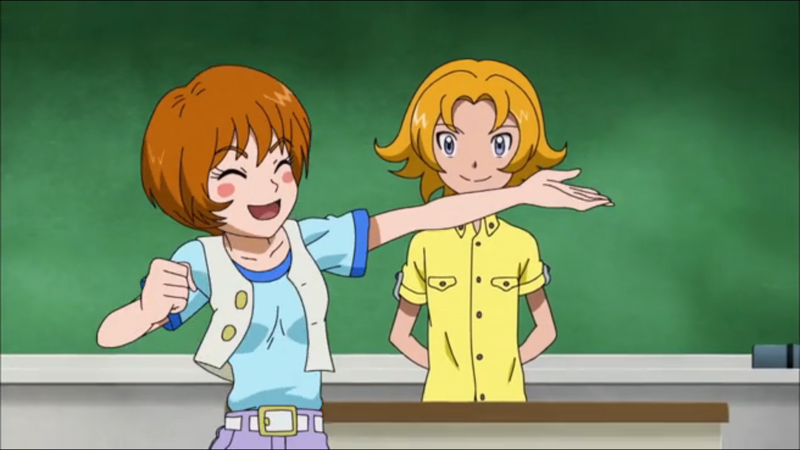 You can't go Tamers and redraw a pentagram when it comprises the student body. You can't go Data Squad and turn the devil into a giant lovable orange. This would have been a hard one to work around, and it would be totally understandable for the hypothetical director to skip it entirely. The sad thing is, unlike other infamous episodes from other series that never saw the light of day, nobody would mourn this one. While the previous episode didn't actually accomplish anything tangible, it finally gave the series a bit of momentum. Now we're all wondering about the mysteries of the clockmaker or the nature of DigiQuartz or, let's be honest, when Taichi's going to show up. While this episode reverts back to form, at first glance it doesn't feel that way. Phelesmon looks appropriately menacing, and his ploy takes the entire student body, including Yuu, captive. It's a more intense situation than some cheap drama about the right way to cook ramen. To everyone's disappointment, it turns out to be a totally conventional Hunters episode. Even worse, if not for a lack of effort, it would be poised to be very good for a conventional Hunters episode. Makoto embodies this lack of effort, deciding before his first day that he'd be unable to make any friends at his new school. This leads to him getting goaded into a deal with Phelesmon before we can even gauge his chances. Maybe we could get behind him if we see him actually trying and struggles due to bullying, an unwillingness to adapt, being too eager to impress, or something else befitting a second-string Frontier character. Phelesmon possesses Yuu and Mami, meaning they're going to be hilariously out of character and befuddling Tagiru, right? That's the idea, but of all the embarrassing things Yuu could have done... he makes a silly face. It shocks Tagiru for sure, but is that really the best we can get? This called for nothing less than the most Youtube-worthy display that Tagiru could lord over Yuu throughout infinity face punches! His balloon face is so tame that Tagiru has to remind us beforehand that Yuu making any spectacle of himself is unlike him. Mami doesn't even change that much, somehow continuing to fawn over Yuu while the entire class fawns over Makoto. Somehow in the middle of possessing an entire student body into performing a Satanic ritual, even Phelesmon doesn't seem that menacing. His manipulation of Makoto and the sight of that pentagram create scary enough sights, but we never get a feel for this guy's endgame. He's drawing their energy to grow larger and... then what? It's the same sort of vague power grab we saw from Pinnochimon and it's hard to really feel threatened by it. It doesn't even take much from Arresterdramon and OmegaShoutmon to bring him down. His conciliatory attitude post-capture is downright laughable, and even Makoto seems to feel sorry for him. If there's anything to pull from all this, it's that Tagiru's positive elements are starting to flourish. He shows kindness towards Makoto through his determination to correct his perceived clumsiness, even without knowing if those chain things had any sentimental value. It's a simple-minded but genuine gesture. He's rewarded by not only avoiding the possession, but earning the tokens that helps free Makoto. He also runs to Taiki at the first sign of a problem, rather than wait for Taiki's spidey signal to go off on his own. It's not the most dire of crises, but the fact he handles it with relative poise is... something, I guess. What are those dolls supposed to be? They're a bit clunky to be bag straps. Also, the M and F suggests a boy and a girl? It's a weird piece of flair. Tagiru says he didn't buy bread for early lunch. Either that's a funky translation or he has multiple lunches throughout the day. The hell's up with Yuu's teeth sparkle? He's not even smiling, but suddenly we're in a toothpaste commercial and the fangirls go crazy. Another possible translation quirk is the “speak of the devil” line as Makoto's party heads outside. That can't possibly be literal, but it's so perfect. The turning to stone powers is sort of dramatic, but in a cheap, inexplicable way that doesn't seem to jive with powers Phelesmon should actually have. Makoto also cures it way too easily. 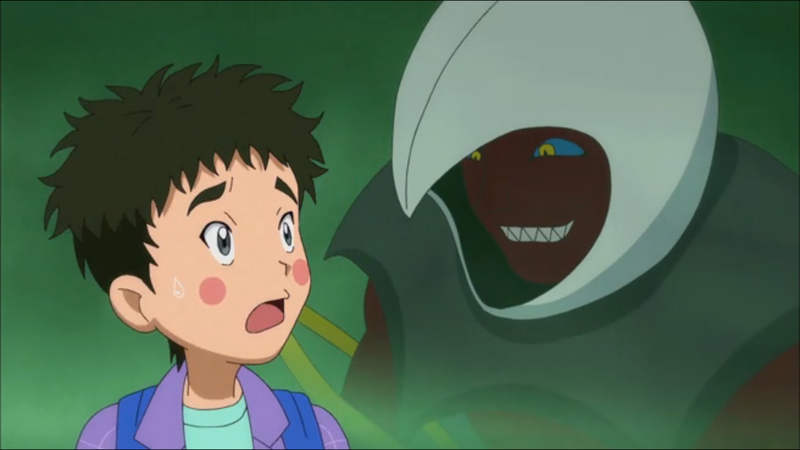 Tagiru's line about the dangers of letting demon Digimon deceive you into making a contract for the sake of friendship sounds like the most awkward letter to Princess Celestia ever. 15 episodes in and the overall GPA for Xros Wars/Fusion has dropped from 3.13 to what Adventure's overall GPA was(2.86) because of Hunters overall(so far, its at a 1.89 GPA). 10 more episodes to go! Love these reviews!